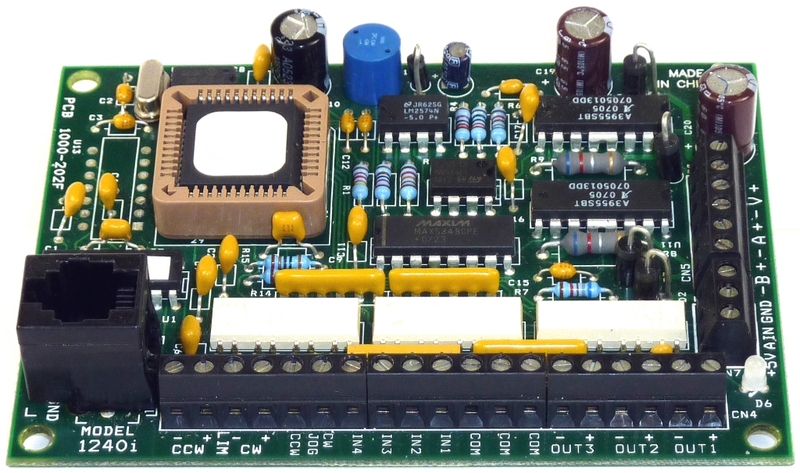 The 1240i is a programmable step motor driver suited for a wide range of motion control applications. It includes a sophisticated controller integrated with a 48-watt microstepping amplifier. The 1240i includes Applied Motion’s easy to use Si Programmer™ Windows software for the rapid development of stand-alone motion control programs. The 1240i can also be commanded from a host PC or PLC, using the Serial Command Language (SCL). For multi-axis applications, up to eight Applied Motion Si™ drives (stepper and servo) can be networked using a single SiNet™ Hub. The 1240i includes eight (8) optically isolated programmable inputs for triggering, branching, position sensing and end of travel detection. Three (3) optically isolated programmable outputs can send signals to other electronic devices and activate relays.